Fuqra is believed to be responsible for an attack on a local mosque in Houston on June 22, 1985. The state is currently home to the “Mahmoudberg” MOA village in Sweeny. At least one previous compound of 45 acres existed in Texas and was raided in 1991. A December 2010 FBI counter-terrorism report said that “the Muslims of the Americas terrorist organization” has a “jamaat” (private commune) in Texas. The Clarion Project identified the location of a MOA Islamic village known by members as “Mahmoudberg” in 2014. Rep. Louie Gohmert (R-TX), then the Vice Chairman of the House Judiciary Subcommittee on Crime, Terrorism, Homeland Security, said the discovery “is more than troubling—it is appalling” and criticized the “lackluster” response to MOA. The declassified FBI documents from 2003-2007 obtained by the Clarion Project clearly identify MOA and Mahmoudberg as a threat worthy of a counter-terrorism investigation. However, one nearby local confidently said that the MOA presence at the location stretches back to the 1980s and that it is closer to 25 acres in size. “The area is so rural it is quite common for residents to shoot firearms for target practice or hunting on private property without interference from law enforcement,” the FBI report notes. Locals reported hearing gunfire coming from the compound in 2014. Pictures were obtained of shell casings from the site. A 2004 report funded by the Justice Department states that Texas has a “training compound” for MOA but was unable to provide a more specific location. One of the commune residents used to be a leader at a MOA compound at Badger, California, according to the FBI. This is likely a reference to the Baladullah compound that was abandoned after a major charter school scam was linked to it, resulting in the arrests of three officials including senior MOA official Khadijah Ghafur. The earliest public reference to Mahmoudberg is a 2005 message board posting promoting a speaking engagement in Houston with a vocalist and lecturer from the site. The MOA mentioned Mahmoudberg in online instructions for a United Muslim Christian Forum (MOA’s interfaith branch) parade in New York in 2010. The instructions have since been deleted. When the police arrived, they saw a dozen African-American males at the scene, about five of which lived at Mahmoudberg. The investigators saw about seven women and children, including a 10-month old infant, who lived there. The police were denied access to the trailer homes at Mahmoudberg and were stopped from directly interviewing the women. The women covered their faces when approached by the police. The men required police to only communicate with the women by passing a note through a male intermediary. A 2005 DEA document refers to the 2002 shooting and says that the Sweeny Police Department said that the MOA commune was the target of a drive-by shooting by several white males from the local community. Another DEA file indicates that Terrance C. Davis III was believed to be the leader of the Sweeny camp. Locals said that law enforcement have visited Mahmoudberg a few times and residents refused to talk to them. One local said that two ambulances were denied entry in 2013 until the police intervened. A search of the Brazoria County criminal records indicates that three Mahmoudberg residents were arrested on February 28, 2013. Two were charged with interfering with public duties and one was charged with reckless driving. The Drug Enforcement Agency first learned of the formation of a MOA chapter in Texas on September 24, 2004, according to declassified DEA documents. The DEA provided data on the MOA camp in Texas to the Terrorist Screening Center. The redacted documents indicate that two individuals were already “known” by the Terrorist Screening Center. This means that the U.S. government had enough evidence linking at least two of the MOA camp residents to terrorist activity to warrant their inclusion in the database. According to a DEA document, the FBI received information on December 23, 2004 that a person wanted for murder in Philadelphia, PA was living at the Sweeny compound. FBI documents obtained by the Clarion Project indicate that the authorities raided a Fuqra/MOA compound about 70 miles south of Dallas that was about 45 acres large on October 11, 1991 and that the multi-agency investigation was spawned by three suspected Texas-based MOA terrorists who were arrested in Toronto, Canada . The compound may have been near Corsicana, as another FBI file mentions seven MOA members buying property in that area. The raid happened about a week after the arrest of five suspected MOA terrorists in Niagra Falls as the crossed into the U.S. from Canada on October 3, 1991. The terror cell planned to bomb the Indian Centre Cinema and Vishnu Hindu temple in Richmond Hill, Toronto, killing up to 4,500 people during the Hindu Festival of Lights event. Three of those arrested were from Dallas: Tyone Cole (also known as Barry Adams), Robert Wesley and Caba Jose Harris. Cole’s son, Hussain Adams, is now the chief executive of MOA and lives at Islamberg in Hancock, New York. They were all found guilty and sentenced to 12 years for conspiracy to create mischief that endangers lives. They were not convicted on murder charges. They were released in 2006 and deported to Trinidad. The documents say that suspects at the compound fled on October 5-6 shortly before the raid took place and their children suddenly disappeared from school. The authorities found four mobile homes, three military general-purpose tents, six vehicles, loose ammunition, books on counter-terrorism techniques and weaponry, and various items with “Jamaat Fuqra Land” written on them. Photos were seized that showed that MOA had conducted surveillance of a post office building and the Greenhead Station in Los Angeles, California. These types of photos indicate that the group was considering them as targets. Two FBI files from the following year mention that MOA members in the state are hiding using aliases, false social security numbers and fake birth certificates. Not a single quote from the FBI documents or the article were included in his report. Mauro personally called Horansky, who responded that he did not see the FBI documents that could be viewed through links at the bottom of the article. Horansky did not even contact the Clarion Project to ask to see the FBI documents before reporting on them. Nor did Horansky’s article mention the origin of the information about Mahmoudberg, thereby preventing the audience from learning more by way of misinformation about the credibility of Clarion and Mauro’s reporting. The reporter filmed from the front of the site, showing a basketball hoop and chickens and stated matter-of-factly that there is no sign that the location is concerning. 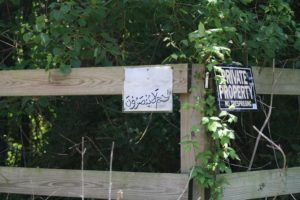 He did, however, mention in passing that the Mahmoudberg residents stopped him at the gate and would not give him permission to come onto the property. The audience was not told that the FBI files say that the compound is 7 to 10 acres large (one neighbor confidently estimated that the property could be as large as 25 acres, which gives the impression that he has seen the entirety of the compound. Horansky reported that Freeport Police Chief Dan Pennington said he had not read the FBI documents before commenting. Mauro also called Chief Pennington, who told him that he also had not read the original article. When asked by Mauro about the connection to MOA and Sheikh Gilani, Chief Pennington rejected concern about Mahmoudberg based on its affiliation with MOA, suggesting that this commune should not be judged by the other MOA communes. The assertion is patently false. There’s no such thing as a MOA commune that is independent of MOA or completely separate from the other MOA sites. All properties are owned by Sheikh Gilani and as such are under his rule, which many of our sources say is Shariah-based. Polygamy, child betrothal, and accepted corporal punishment have all been reported and confirmed with law enforcement who have been and are currently involved in Fuqra investigations. The FBI documents clearly state that some members came from other MOA communes, including a leader from the Baladullah compound in California that was abandoned after its charter school scam was stopped. In addition, Mahmoudberg had a non-profit named the Muslim Model Community with a resident named Idris Johnson as the registered agent. Idris Johnson was the Master of Ceremonies for an interfaith MOA event held in Binghamton, New York. Freeport Police Chief Dan Pennington’s view of Mahmoudberg is less surprising when you consider that a member of the Freeport Police Department is a reported resident of Mahmoudberg. Two reported MOA members are local law enforcement officers. Sources indicate that a third one was a constable in Harris County until 2013. MOA members have tried to infiltrate law enforcement since the early days. Freeport Police Officer Husain Jones is reportedly a resident of Mahmoudberg. Several locals did confirm to the Clarion Project that a police officer lives at Mahmoudberg. Sources confirmed that he associates with MOA members. Jones responded to reports about his link to MOA by saying it is a “defamation of character” and the authors haven’t even met him. The article identified him as a Police Detective. A police officer present at the 2002 shooting at Mahmoudberg said that a constable from Fort Bend County arrived who was also a MOA member. The constable reportedly confronted the police who arrived at the scene and joined the Mahmoudberg residents in denying access to the officers and medical responders who arrived in ambulances. The constable was reportedly fired due to the incident. Credible sources independently told the Clarion Project’s Ryan Mauro that a constable in Fort Bend County is a member of MOA who does not live at Mahmoudberg and is related to Freeport Police Detective Husain Jones. The U.S. Justice Department designated CAIR as an unindicted co-conspirator in the trial of the Holy Land Foundation, a CAIR-linked charity that was shut down for financing the Hamas terrorist group. The Justice Department identified CAIR as an “entity” of the U.S. Muslim Brotherhood’s Palestine Committee, a secret body established by the Brotherhood to advance Hamas’ cause. The United Arab Emirates, a Muslim country that previously supported CAIR, designated the organization as a terrorist group when it decided to ban the Muslim Brotherhood. A 2003 document from the DEA’s El Paso Intelligence Center about MOA (referring to it as the “Jamaat Ul-Fuqra terrorist group”) is heavily redacted but shows that the file is indexed under titles for other groups under investigation, indicating a connection between the two. The other related groups are the Hamas terrorist organization, Palestinian Islamic Jihad terrorist organization, Ajouly Money Exchange, Chicago Islamic Center and Islamic Center of Lexington. The 2003 file from the DEA’s El Paso Intelligence Center shows it was distributed to its Regional Office in Guadaljaro, the capital of the state of Jalisco in western Mexico. This indicates a link between MOA’s Texas activity and that part of Mexico. A separate DEA investigation into MOA in Virginia in 2004 stated that MOA drug traffickers were dealing with Mexican cocaine dealers. Sources inside MOA have confirmed that MOA has one of its “Islamic villages” in Mexico and that it is expanding. A source inside the group said in 2017 that it is led by a MOA elder named Khalifa Muhammad Khalil. Other MOA fronts in Texas have included non-profit organizations like the Muslim Model Community of Texas (which shares an address with Mahmoudberg) and the First Muslims of Texas in Houston. A document from the 2005-2006 DEA investigation into the MOA camp confirmed that the Muslim Model Community of Texas is “associated” with the camp. An online directory of MOA “Dawah Centers” that has proven accurate in the past identifies a MOA Da’wah Center at 11315 Fairmont in Houston. Mauro, Ryan. (2014). “Exclusive: Islamist Terror Enclave Discovered in Texas.” Clarion Project. Mauro, Ryan. (2014). “Texas Congressman: Terror Enclave Discovery ‘Appalling.’” Clarion Project. Islamist Terror Enclave Discovered in Texas, supra note 2. “Houston: A Ladies Day Out,” Islamic Forum, March 24, 2005. “Militant ‘Muslims of America’ Pulling Out All Stops for NY Parade,” Creeping Sharia, March 12, 2010. Horansky, Andrew. (2014). Small Muslim Community Struggles with ‘Terrorist’ Rumors. KHOU 11 News. Mauro, Ryan. (2014). Texas Terror Enclave Exposed. FrontPage Magazine. Geller, Pamela. (2014). Texas Police Double as Mahmoudberg’s Militia. WorldNetDaily. Geller, TX Police Double as Mahmoudberg’s Militia, supra note 11. Daughtry, Shannon. (2014). Freeport Officer Responds to Article Questioning His Faith. TheFacts.com. Mauro, Ryan. (2014). CAIR Defends U.S. Jamaat ul-Fuqra Terror Group. Clarion Project. Mauro, Ryan. (2013). Council on American-Islamic Relations (CAIR) – Nat’l Headquarters. Clarion Project. Mauro, Ryan. (2014). UAE Doubles Down on Designation of CAIR as Terrorists. Clarion Project. Goddard, John. (2010). Forgotten Islamist terror plot targeted Toronto. Toronto Star. “AMLC Feeding People, March 17, 2011,” American Muslim Ladies Club—Texas chapter website, March 29, 2011. “MOA Da’wah Center Directory,” Al-Adaab.org.